As an undercover police officer the player's mission is to put a stop to an array of criminals ranging from bank robbers, hijackers and numerous other law breakers. As well as upholding the law, players must also try to protect innocent members of the public from the criminal gangs, being careful not to accidentally shoot them. Shooting innocent victims will result in the player's energy level being severely reduced. Lethal Enforcers is an on-the-rails light-gun game. The player is initially armed only with a standard issue revolver, but weapon upgrades such as a .357 Magnum, a shotgun and an automatic pistol can be collected by shooting at their on-screen counterparts as the game progresses. While some weapons can be reloaded, others can't and are only useful for a limited time. Any weapon upgrades are lost in the event of a player losing a life. 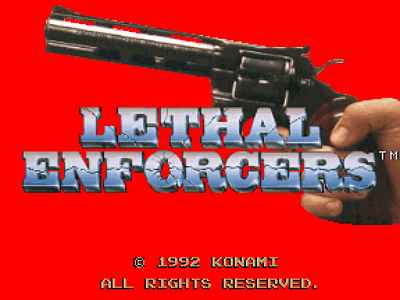 Lethal Enforcers was released in October 1992. 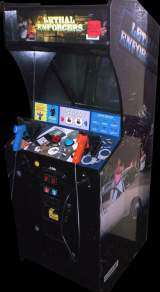 The game was a big hit in arcades, especially younger male audiences tended to widely accept the game. The mix of lightgun action, digitized graphics and sound and the multiplayer feature made this game an attractive addition for almost every arcade, quickly regaining the purchase cost in most cases. The machine could be switched to "Street Mode" or "Arcade Mode" in the settings, where "Street mode" allowed the player to select the desired stage while "Arcade mode" followed the stages in strict order. There were two different lightgun types used, a Revolver style lightgun that resembles the gun from the title screen and a slightly smaller gun that resembles a semi-automatic handgun. The probable inspiration for the title screen introduction for Lethal Enforcers is the 1973 film 'Magnum Force' starring Clint Eastwood. King Records released a limited-edition soundtrack album for this game (Konami Amusement Sounds '93 Summer - KICA-7616, 7617) on August 21, 1993. Michael Jackson used to own this game (serial number: 191251). It was sold at the official Michael Jackson Auction on April 24, 2009. 1. It is possible to see the ending in street mode provided that the main stages are selected and not the training range, but only on the japanese version. 2. Some of the criminals shout "Die, pigs!" as a taunt in the Japanese version. This taunt is omitted from the US version due to the "pig" taunt being considered as a strong direct insult towards police officers. 3. The reloading animation is different. In the japanese version, it shows how the gun is supposed to be reloaded, while the US version features an animation on how to reload by showing a female shooting the gun outside of the screen. * On the first area of Stage 1 (the bank robbery), a masked gunman in black will roll out from behind the desk at the front of the room at the left end of the screen. You need to shoot the enemy as quickly as possible when he first appears, and if you do, an assault rifle will drop to the floor. Shoot it quickly to pick it up. * On the second area of the same stage, in the street behind the bank, when you've nearly completed it, there will appear another masked gunman at the left end of the screen, and if you shoot him quickly enough the first time he pops out, a rifle will drop to the ground too. Shoot it quickly to get it before it disappears. * On the third area of the Stage 3 (the airport), there are two terrorists with large rifles hidden inside two crates that take two shots to kill. When you complete the five stages the game has and the game starts again with increased difficulty, another of these gunmen will burst out of a luggage carrier on the second area of the same stage. * At the left end of the third area on Stage 3, there's a fuel truck that takes a couple shots to blow up. If you can shoot it at the right moment, the explosion will affect at least one terrorist hiding behind it. * On the first area of Stage 5 (the chemical plant), there's a bridge platform at the top right that leads above the office room. You can shoot this platform down with several shots to keep enemies from crossing it.